The Soul Immigrants have established themselves as a name in the UK's contemporary funk scene to be revered as highly as any band you could compare them with. Initially formed in the 1990s, by Emrys Baird and Nitin Sawhney, the band has seen its fair share of evolution over the years but it's design has always remained intact: the focus on old-school sensibilities with their own distinctly contemporary twist. In 2015, fans were treated to an exciting stage in Soul Immigrants' evolution with their album, 'The Hustle Is On! ', which is a classic modern-day funk and soul record. It's a statement that doesn't warrant a discussion. Preceded by the singles 'The Ghetto (There's No Way Out)' and 'Sunk Without The Funk', the album is packed full of fast-paced funk and sweet soul songs like 'Yard of Hard', 'Take Him Back To The Projects' and 'Golden Summer Rays'. Now in 2017, evolution has taken the Soul Immigrants into a new direction. Re-imagined as a trio for their brand new EP, this stripped-back approach works wonders when tackling the four chosen songs for their project, 'Covers For Lovers & Others'. As far as tackling cover versions go, this would make an exciting concept for a series of these EPs imposing these rules as a springboard for each EP. And as expected, everything comes together superbly: Ain't No Sunshine' is certainly the gamble that pays off, but the re-imagining of Eric Clapton's classic may be the show-stealer here. 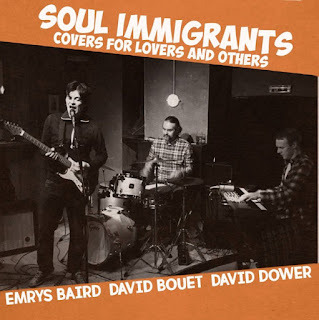 As always, it will be exciting to see where evolution takes The Soul Immigrants next... as fans wait patiently for a new album of original material, which is already in the pipeline, for now there's a brilliant EP that deserves your attention. 'Covers For Lovers & Others' is available on Spotify and iTunes.